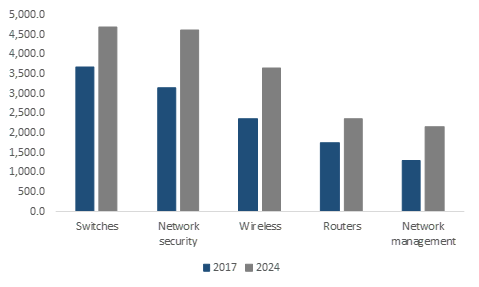 Enterprise Networking Market size was estimated at over USD 62 billion in 2017, growing at a CAGR of over 6% from 2018 to 2024. 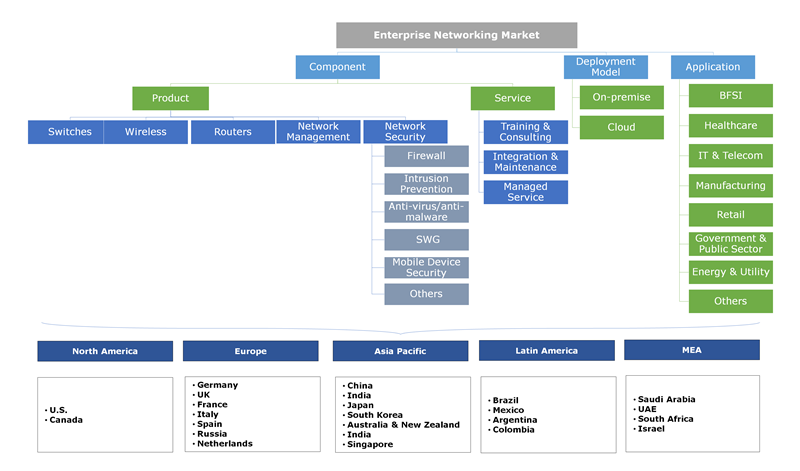 The enterprise networking market is expected to witness an accelerated growth over the forecast timeline due to the growing demand for internet-enabled devices and a huge adoption of virtualization technologies such as Software Defined Networking (SDN) and Network Functions Virtualization (NFV) by the enterprises to reduce the storage infrastructure costs. Due to the excellent flexibility offered by virtualization solutions, the organizations can scale their networking infrastructure in response to increased workloads by using cloud computing. Also, networking solutions help them to better integrate the disparate network resources with their overall IT operations. An increasing popularity of the BYOD trend is also expected to drive the enterprise networking market growth as there is a rise in the number of mobiles and BYOD devices in the enterprises, further accelerating the demand for high-capacity enterprise networks. The growing complexity of enterprise networks is driving the demand for network monitoring & security solutions, allowing enterprises to optimize their networks to accommodate new resources while protecting sensitive information. 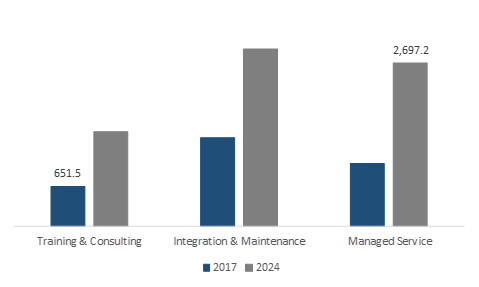 The network management market is projected to grow at a CAGR of around 7% over the forecast period. The market is driven by the proliferation of new applications & devices, generating a demand for enterprise network management solutions to manage the complexity of modern networks. The rise in the number of remote devices, users, and applications has fueled the need to implement enterprise-class solutions that provide the requisite support to manage these resources. The increasing demand among enterprises to manage their network assets to easily monitor their network performance, support multi-vendor IT environments, and gain a complete visibility & control over their networks is expected to drive the demand for enterprise networking solutions. Managed service in the enterprise networking market is expected to hold a market share of over 35% by 2024. As the network infrastructure is rapidly evolving with the introduction of new applications, devices, and technologies, enterprises are turning to managed network services, seeking the help of external experts to design and maintain the network, once it is deployed. The reliance on third-parties enables them to become more agile and free up internal resources to work on innovation and development. 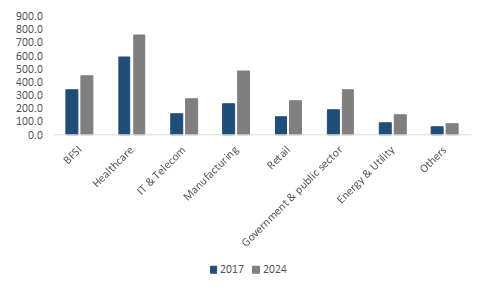 The cloud-based deployment model in the enterprise networking market is projected to grow with a CAGR of over 9% from 2018 to 2024. The cloud-based model provide a comprehensive set of service and frameworks that enable enterprises to quickly adapt to new business needs and reduce costs. These models offer a new way to operate and manage distributed enterprise networks and provide network capabilities via a cloud infrastructure that requires less or no additional investment in physical IT resources. The IT & telecom sector in the enterprise networking market held a major share of around 30% in 2017. Securing network infrastructure is a major concern for the IT & telecom industry as the companies rely heavily on the robustness of their IT infrastructure to ensure smooth and secure operation of almost all their business processes. Any disruption in their network operations may result in a substantial loss of mission-critical data of companies as well as their clients. Thus, they are rapidly adopting enterprise networking solutions such as network monitoring, network security, and virtualization technologies to increase their operational efficiency and maintain their complex network set up. North America held a major share of around 40% in the enterprise networking market in 2017 and is expected to dominate the market throughout the forecast period. The market growth is attributed to the increasing cases of cyber-thefts in defense & banking institutions. The growing complexity and diversity of cyber-attacks have driven the need among organizations to implement network traffic monitoring & security solutions to reduce the likelihood of large-scale data thefts. The growing popularity of BYOD and IoT trends has also resulted in the growth of cyber-crimes, forcing organizations to use network security solutions. An upsurge in connected devices in the region has made enterprise networks more complex. The evolving network landscape has generated the need among enterprises to reassess their network security infrastructure and adopt robust network monitoring solutions. The companies operating in the enterprise networking market are investing in modernizing data centers. The rapid growth of the data center ecosystem is expected to fuel the adoption of server virtualization technologies. As big data demands established network infrastructures, the IT network operators have been adopting new strategies to extend the capabilities of their networks. For instance, in September 2018, DocuSign launched its new data center in Canada as a part of its commitment to serve the Canadian market and to address the data security requirements of organizations across the country. The IT companies are rapidly adopting cloud-based solutions and collaborating with telecom operators on virtualization technology to support various use cases. For instance, in September 2017, Atos entered into an alliance with Dell EMC, Intel, Juniper Networks, Red Hat, and VMware. Under the alliance, the companies worked jointly to build an architecture using Commercial off-the-Shelf (COTS) products that help their mutual clients reduce their CAPEX costs and increase business agility. Some of the major companies operating in the enterprise networking market are Arista, Broadcom, Checkpoint, Cisco, Dell Technologies, Extreme Networks, F5 networks, FireEye, Fortinet, HPE, Huawei, Juniper, McAfee, Netscout, Palo Alto, Riverbed, Symantec, Trend Micro, and VMWare. In the legacy network architectures, enterprises struggled to maintain agility and to keep up with the changing network requirements. As they have started moving toward a new digital age, the enterprise networks are becoming more complex. With the proliferation of new virtualization architectures and cloud data centers, network traffic is increasing at a faster rate, driving the demand for robust network management solutions to ensure business continuity and effective disaster recovery. In legacy architectures, in case of any disruption in the network, alerts regarding incidents were obtained from various siloed individual feeds or third-party systems. However, with the adoption of new network monitoring & management tools, enterprises can gain a complete visibility and control their network resources more effectively.